Select Clothing On Sale Now! Free Consultations and Expert Advice! Bowen’s Power Sports carries new models of Suzuki and Can-am ATV's suited for work or fun. We're your best source for all things ATV in the Utica, NY area. Find the snowmobile that you've been looking for and start making the most of the winter season. Whether you want a motorcycle built for speed, performance, comfort or just fun transportation, we have you covered! Looking for a fun machine that throttles up your thrill meter with every ride? You’ll find it among the great selection of brand-new snowmobiles, motorcycles and ATV’s at Bowen’s Power Sports in Ilion, NY – not far from Utica! We carry the latest snowmobiles by Ski-doo, plenty of Suzuki bikes and scooters, and ATV models by Suzuki and Can-am. And we have nearly any accessory you need, from helmets to jackets to boots, gloves and lots more. Two- and four-wheeled utility – and fun! Our staff will be happy to help you choose the right vehicle for you, whether for pure fun, workhorse reliability for the farm, home or job, or flexible utility for the hunter or fisherman. And if you need service or repair for your sled, bike or all-terrain vehicle, our certified mechanics have the parts, tools and experience to do the job correctly in every detail. Stop in at our friendly shop or call us today at 315-894-1128. We’ll be glad to help you all the free advice and consultation you need. Snowmobile Sales, Service and Accessories – speedy sport models, touring sleds, etc. We’re a family-owned, service-oriented shop whose first goal is your complete satisfaction. If we don’t have a part or the machine you want, we’ll get it for you. If you need us to stay late for your machine’s service, or to install a part for an emergency on a Sunday, we almost always can accommodate you. Ours is a simple business model – we treat you the way we would like to be treated! Get your revs up and go – across the roads, dirt and snow! 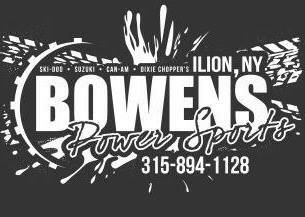 Contact Bowen’s Power Sports today at 315-894-1128 for the best Ski-doo sleds, Suzuki bikes and Can-am ATV products and services on the market, or browse our website for more information about our products and services. Copyright © 2019 Bowen's Power Sport, all rights reserved.